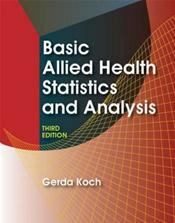 Abstract: This comprehensive resource is designed to give health information management student or practicing professional a keen understanding of how health care statistics are computed and applied in health care settings. The hands-on approach requires the learner to think through a problem and choose the appropriate data to apply. The well-explained examples and numerous practice opportunities are designed to encourage mastery of concepts step-by-step!